Say Hello to Spring in 16 Different Ways! Despite the flurries of snow today, spring is HERE! And what better way to kick winter to the curb and welcome spring then with a visit for froyo at 16 Handles in Fairfield?! While I do eat ice cream and frozen yogurt year round (doesn’t everyone? ), there’s no better feeling than stopping for a cone (or bowl) during the warmer months. It always makes me smile like a kid and my husband likes to occasionally surprise me. When he pulled the car into the parking lot on the eve of the first day of spring, I realized we were going to 16 Handles and I might have *might have* let out a “Woohoo!” and then I quickly started making the decision in my head – what flavors do I get? There are 16 flavors for you to always choose from (and according to their website they are all kosher certified). Many of the flavors rotate and change but there is always something for everyone, and 16 Handles’ website posts the daily flavors if you want to take a look before you visit. 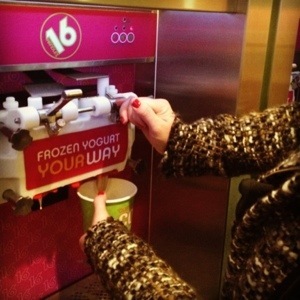 16 Handles is a self-serve frozen yogurt shop so you get to fill your cup as much, or as little as you please. Cost depends on the weight of your cup or bowl. Also, the staff is always available to help you and give you a bite-sized sample to try before you fill your bowl. 16 Handles has the largest variety around of toppings, in my opinion, with everything from fresh fruit and the traditional toppings you’d expect, to some a little more out of the ordinary such as vanilla clodhoppers and walnuts in maple syrup (you can find out more info about their toppings here). The froyo is delicious, some personal favs: peanut butter, cookies and cream, mint, coffee, salted caramel, and red velvet. 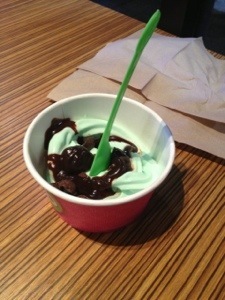 Why do I love 16 Handles so much that I cheer like a child when we pull in the parking lot? It’s like building your own froyo sundae, and who doesn’t like doing that? 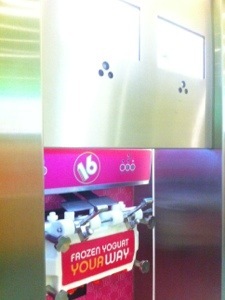 Another reason I like 16 Handles? 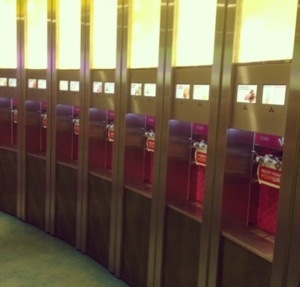 The environment is important to 16 Handles and they have their own recycling campaign. Aside from using cornstarch spoons and biodegradable cups, and they are also partnered with Trees for the Future and each location helps plants trees daily. Personal Tip: I always have trouble deciding at most ice cream or froyo shops, and 16 Handles makes it easy for me – I simply put a little of several flavors in my bowl. 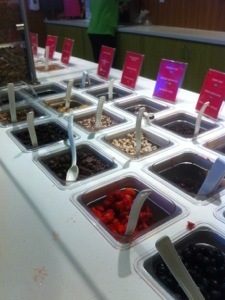 I don’t mix them, I sort of have a few little dollops of froyo and then add toppings. 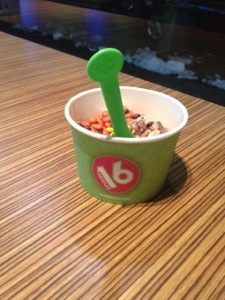 16 Handles is the perfect solution for the indecisive person (or kid) in your life! TIP: I learned last night that 16 Handles does not make milkshakes, however you can fill a cup with the flavor(s) and toppings of your choice they will blend it similar to a DQ blizzard – DQ is my other go to ice cream place in the summer but I’m getting ahead of myself.